A one – day working visit has been paid to the residents of Tano South Municipality by His Excellency Nana Addo Dankwa Akufo – Addo, the President of the Republic of Ghana and Commander ­- in- Chief of the Armed Forces. In his arrival at Bechem, he and his entourage paid a courtesy call on Nananom at Omanhene’s Palace to interact with the chiefs to find out problems confronting the residents of the Municipality. In a short but impressive welcome address, Nana Fosu Gyeabour Akoto II, the Omanhene of Bechem Traditional Area on behalf of other chiefs thanked the President for making time out of his busy schedule to pay working visit to the residents in the Municipality. He informed President that the road networks in the Municipality are in a deplorable state and pleaded with President and his government to do all it takes to tar the roads and create another district from the existing Tano South Municipal Assembly to serve the people at Derma and its environs. He said when the roads are tarred; it will help to reduce road accident, minimizes criminal activities on the roads and makes farmers to be able to transport their farm produce to urban centers for sale etc. From the Omanhene’s palace, the President met general public at forecourt of Bechem Community Centre to explain government’s achievements and things government intends to execute in the Municipality and the region as a whole. 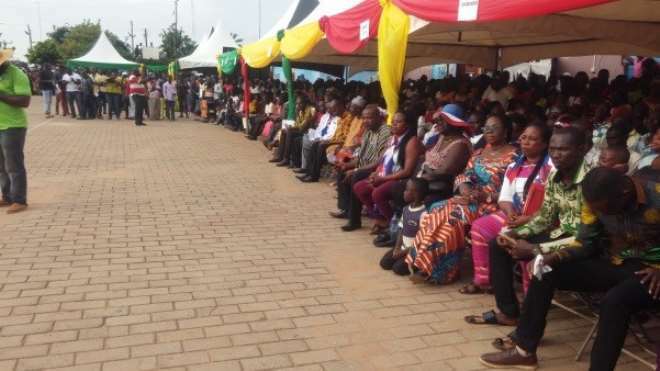 He thanked Nananom, Civil Society Organizations, political parties’ executives, heads of department and government agencies and all those who helped to make Ahafo Region created and urged residents to come together as one people to fight for development rather than allowing politics to disintegrate them. He stressed that government have completed all documentations including the procurement activities on Bechem Town roads and said in no time, the roads would be tarred by government. He said different bi-elections’ brouhaha has been taken place in some part of the country over the years, and to end this menace, he has presented vigilante group bill to parliament for consideration and emphasized that when the bill is passed, it will help to reduce or address the election violence and urged citizens to desist from all forms of activities which will undermine the 2020 presidential and parliamentary general elections and as well as the district Assemblies elections. He reiterated that a country without peace is like a ship without captain going round a sea and advised legible voters to vote against any political party which will use guns and cutlass to intimidate voters before, during and after 2020 presidential and parliamentary general elections and used the occasion to catalogue some of the achievements of government. The programme saw dignitaries like His Excellency Nana Addo Dankwa Akufo – Addo, the President of the Republic of Ghana, Hon. Kwaku Asumah Kyeremeh, the Minister of Lands and Natural Resources, Hon Alan Kyeremateng, the Minister of Trade and Industry, Hon Nana Ato Atta, the head of Local Government and civil service, Hon. Hajia Alima Mahama, the Minister of Local Government and Rural Development, Hon Adjei Korsah, the Deputy Minister of Regional and Reorganization Development, Nana Agyeman Prempeh, the Director General (NADMO), Hon. Evans Opoku Bobie, the Minister for Ahafo Region and MP for Asunafo South Constituency, Hon. Benjamin Yeboah Sekyere, the Deputy Minister for Ahafo Region and MP for Tano South Constituency and Hon Evelyn Kumi Richardson, the Minister for Bono Region.